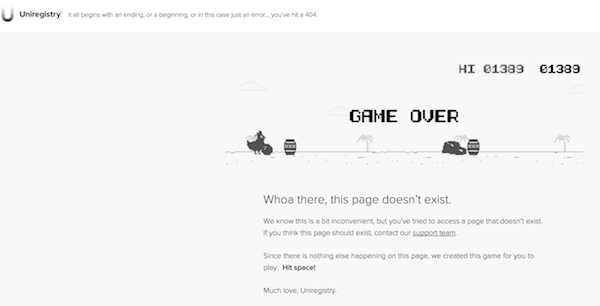 Uniregistry has a fun “Easter Egg” game on its 404 error page. Visit any non-existent page on Uniregistry.com (say Uniregistry.com/Elliot for example), and you will see a 404 error page with a prompt to play a game. To start playing the game, just hit the spacebar. The chicken in the desert appears to be running as it moves towards objects. Use the spacebar to jump over the objects. The longer the chicken continues running without hitting or landing on one of the objects, the more points are accumulated. I played for a few minutes last night, and my high score after a couple of tries was 1389. I am sure there are much higher scores achieved by people with more patience than I have! If you play the game, I invite you to share your high score. Thanks to Uniregistry General Counsel Bret Fausett for tweeting about this yesterday. We update our site a lot and with the complexities of domain registrations and management we need to be offline for a few minutes once in a while to deploy updates (we tie in with a lot of partners as you know). Who really wants to stare at a static image with a little text, boring right? Enter the ubiquitous ‘We’re deploying shiny new code’ page. Our deployment page has been around forever and we just thought it was time to do something a little more fun. We came up with the idea when we were confronted with the Chrome T-Rex game – and had the inspiration to create our own game with Eric (or Erica) the chicken as the star (we never really settled on whether it was a boy or a girl). Quote: “If you’ve been to Cayman, you’ll know that feral chickens are a distinct part of the landscape, and represent part of the identity and experience of the Cayman Islands.” said Darren Cornwell, Product, Uniregistry. If you look closely you’ll see the palm trees of Cayman flashing past as Eric, the chicken tirelessly tries to avoid coconuts, piles of rocks, and of course the oh so popular Cayman rum. I think the highest score in the office in somewhere around 3000; we’re building cool stuff all day long so we don’t get a lot of time to venture out with Eric. We just wanted to do something different, something fun – we spend a lot of time working on our products trying to figure out what makes people tick, why not a game? All in the game took around 20 hours or so to build, and at one point we had 3 of us working on it for a few days straight. It’s a labor of love though, who doesn’t want to build a game? Watch this space, we’ve been toying with the idea of doing a version 2 with more levels and some more Uniregistry centric background animations…. if you’ve visited Grand Cayman it’ll feel super close to home. Let’s see if a window of time presents itself. We also use this game on our 404 page, just in case you take a wrong turn on the site somewhere. Just played once and ended up scoring 1,893.